Two males are wanted for robbing the Airport Chevron Mini-Mart at about 12:55 a.m. Thursday. 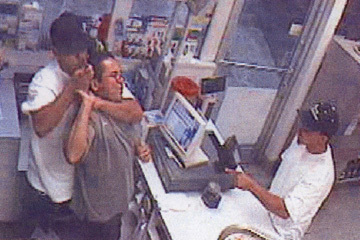 Here, the first suspect removed the cash while the second suspect brandished a knife and held it to the cashier's throat. The face of the cashier has been blurred to protect his identity. Police are looking for two men who held a cashier at knifepoint while robbing a gas station convenience store near the airport early Thursday. At about 12:55 a.m. the cashier, a man in his 40s, let the two men into the otherwise empty store at the Lagoon Chevron Mini-Mart at 2604 Waiwai Loop, police said. One of the men approached the cashier and started talking to him. The other suspect, armed with a knife, walked behind the counter, held the cashier in a choke hold, placed the knife to his throat and demanded he open the cash register, police said. The first man then removed the cash while the man with the knife assaulted the cashier, police said. A 40-year-old female cashier, who asked not to be identified, said yesterday that the store will no longer allow customers inside the minimart after 10 p.m. and that the owner is taking other security measures. Police are hoping someone will recognize the two men from the images on surveillance video. Both suspects are men in their late 20s and wore white T-shirts, blue shorts, dark baseball caps and white sneakers. The first suspect is described as 5 feet 10 inches tall and weighing 160 pounds. The man with the knife is about 5 feet 6 inches tall, weighing 170 pounds.